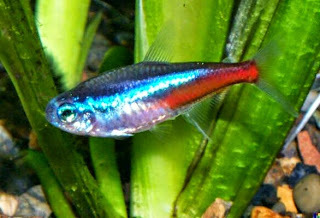 Neon tetra is a attractive and most popular small fish for planted aquarium, Neon tetra has a silver white abdomen with prominent iridescent blue horizontal stripe with prominent an iridescent red stripe that begins from the middle of the body till the start of its tail. Neon Tetra is a peaceful schooling fish for planted and community aquariums. They should be kept in groups of more than 6 per group. Neon Tetra fish prefer soft, slightly acidic water for optimum health conditions, and avoid strong currents to help them swim easily. If the water quality is maintained and treated with live food, they will spawn easily and live longer. They are best kept in a heavily planted. Difficult, for Beginners. Schooling Fish should be kept in 3 – 10 in numbers. Males are slim. Mature healthy females have round belly with bent blue iridescent stripe when compared to males. Nice post about planet fish aquarium. We are also sellers and Dealers of planet fish aquarium in Chennai,India.